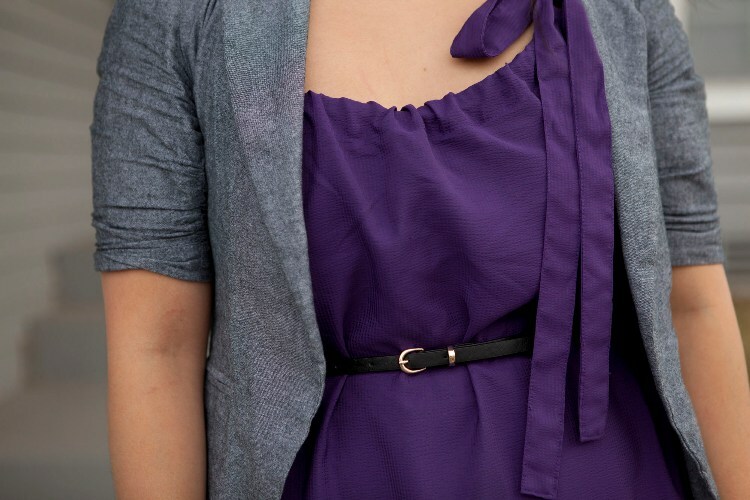 She is Lovely: SFW: Classy Purple + DSK Winner! Cute dress and such a pretty colour, a very versatile piece, which can take you from day to night as you say. Lovely color of the dress. And blazer is one of those pieces that you can wear easily with lots of different things. So much in love with that purple dress!!! The color is great on you Shiela and you look pretty. I tried making the bulgogi noodle/soup recipe on your previous post and it turns out good. Love the dress! Gorgeous! Perfect fit! You look very lovely in that outfit Sheila!! I absolutely love you in purple and the dress looks great on u!!! I think next time you would take pics of both the work and night outfits =) I'm sad I didn't win but looking foward to ur next giveaways! I do have a question to ask you though, what would you recommend someone to wear with a similar dress that doesn't look good in blazers? Great outfit; love your dress <3. You look stunning in that dress, you're very cute. I am following you from Rome. Cute dress, and the color purple looks great on you! I love wearing blazers! what a great fall outfit! i lovveee that purple on you! Oh hey that's us! =D I do love this purple on you - especially with your eyeshadow. Looking gorgeous as always! Great fall colour! For fall I've added coloured denim and my python pieces. You look great. I worked at Old Navy when that dress came out! LOVE your outfit! Very beautiful and feminine! I love your outfit! That's my fav combo, purple and grey and congrats to the winner! You are too cute! I am loving your blog. You now have a new subscriber. love love love the dress!! !and yes we would like to follow each other, we added you first-followers number 250! purple looks cute on you! I love the deep purple dress! That's one of my favorite colors! aww i love this!! purple is so pretty on you! 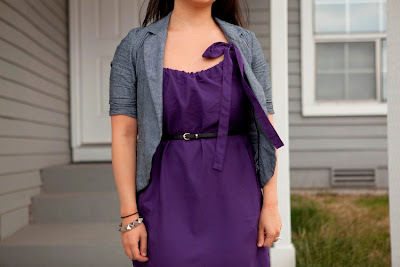 and so perfect for fall.. i really REALLY adore purple and grey combo it's such an unexpected combo!! The dress is pretty, love the colour! You're so cute! I like how you included a way to take the look from work to hanging out! 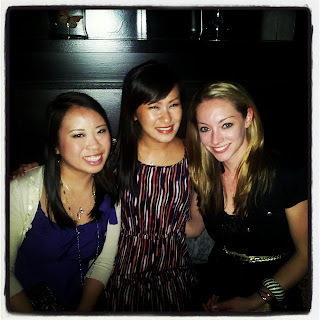 Looks like you ladies had a fabulous time out! I love that dress, I remember it from Old Navy! You look so cute and I love the purple on you! love SFW dresses! :) and How to Cook a Wolf is a cute date night dinner spot, definitely recommend! Found your blog through Blog Love Therapy blog hop. I just followed you may be could follow each other. I love your dress, lovely colour. Lovely dress....Purple is definitely your color! Purple look great on you! I love that dress! I'm your new follower! thanks for the giveaway! I'm so excited! such a wonderful color for fall! Love it! Love the jeweled tone dress. i love deep, rich colors in the fall. Great post! Purple is definitely your colour! I love that shade of purple! Your dress is darling. Congrats to the winner! Love your dress! The color looks incredible on you! aw you guys look great!!! and congrats on the winner! that color is gorgeous on you! love it!! Great giveaway!! You looked like you had a blast that night! I can see how in that dress. 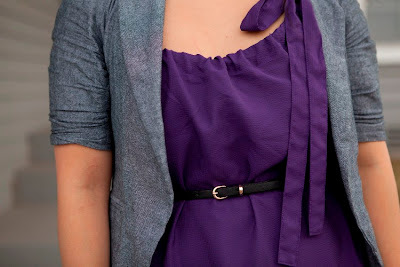 Great purple dress! Loved seeing how you styled it two different ways! Cute look! Loving the purple/grey combo! Love this purple colour on you, you look great! do you wanna follow each other? LEt me know. I'm following via GFC and Bloglovin! This color is great on you. Love the jewel tone! I love wearing blazers to transition outfits into fall, just like you've done here! Cute look! ure looking lovely in purple, the colour is suiting u so well. i hope you follow me back because i love your blog!! Love the color of this dress on you, you look gorgeous! the color of this dress is simply amazing! love it! you have a really nice blog! would u like to follow each other?